Coffered ceilings are an option to add visual and architectural interest and instant personality to any space, no matter a large or a smaller one. Actually, coffers are repeated sunken panels, usually yet not necessarily square or rectangular, trimmed with boxed beams. This ceiling treatment, which can be traced back in architectural history to ancient Rome, was reinvented by the 1800s. Whether using wood, including reclaimed panels and beams, drywall, plaster, tin tiles, moldings, hand-painted motifs, or bold geometric patterns to a make a coffered ceiling, this architectural feature is definitely an opportunity to add a sense of unexpectedness and create a unique space. Coffered ceilings are used for both decorative and functional reasons. Apart from an eye-grabbing embellishment, they also help hide any imperfections and absorb noise. Furthermore, especially in rooms with high ceilings, they create a sense of coziness and a homey atmosphere. Plus, in open-floor plan spaces, coffered ceilings help define different zones. Note that when pipes, ducts, electrical cables, and more need to be hidden, especially when remodeling basements and attics, coffered ceilings are definitely a practical solution. Generally, when it comes to adding depth, dimension, drama, character, style, and elegance to any space and lending it a formal look, always consider installing a coffered ceiling. 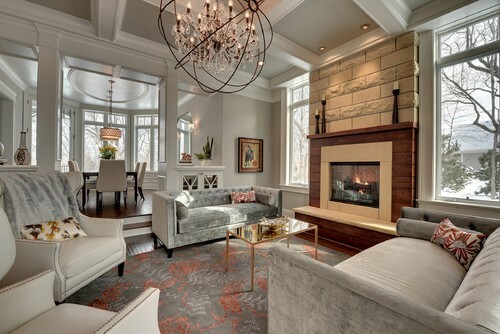 Unquestionably, with simple, clean lines or intricately ornate, coffered ceilings work well in any space, always make a statement, and offer a way to transform even the most boring room and take it to the next level. Although with usually square or rectangular sunken coffers, this classic, simple ceiling design can be easily customized to add personality to any space. Whether with paint, wallpaper, tiles, ornate molding, or eye-grabbing lighting solutions, the options to create a sense of unexpectedness and add visual interest are literally endless. This style works well in spaces of traditional, classic design. Thus, in a space with dark walls, a crisp white coffered ceiling definitely makes a statement and adds contrast. In rooms with white walls, a coffered ceiling in a hue, which matches the flooring and some of the furniture pieces is a way to create a balanced, harmonious look. For extra doses of visual interest, with painted panels and trims kept white/or vice versa/, any homeowner can go a step further and come up with a coffered ceiling design solution that offers contrast within itself. Using wallpaper instead of paint, flat boards, drywall to create minimal beam design, an asymmetrical beam arrangement, and bold, modern lighting are options for a contemporary twist on the traditional-style coffered ceilings. As for lighting, usually, a hanging fixture dropped from the center of the ceiling is complemented by recessed lighting. In darker spaces, installing lighting into the trim is a creative way to add more artificial light. When and where possible, consider combining a coffered ceiling with a skylight. This approach is definitely a stunning option, which provides some extra natural light, brings visual interest, and creates a space with tons of personality. For a harmonious, cohesive look, especially in living rooms, a coffered ceiling can be paired with wall paneling that mirrors the coffers. In the picture above, a magnificent formal dining room. A traditional crisp white coffered ceiling is complemented by a pair of stunning beaded chandeliers. Hardwood flooring, grasscloth wallpaper, linen window treatment, a wooden table, and a sisal rug add an organic vibe to the space. Flowers bring splashes of color and freshness. A combo of matching wall sconces flanking an oversized botanical print adds visual interest. Truly a serene yet impressive space! Above shown is a fascinating traditional living room with a coffered ceiling with painted inner parts and white trims. A fireplace creates a sense of comfort and a homey atmosphere. Floral-patterned throw pillows and an area rug add color and touches of coziness. A striking large orb crystal chandelier immediately grabs the eye, makes a stunning statement, and helps create a truly unique space. 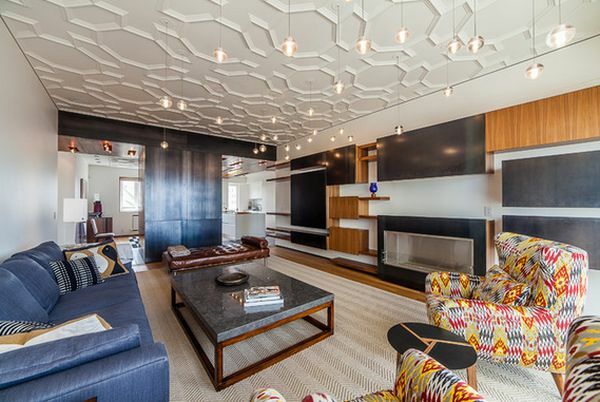 Above, another two-color statement-making coffered ceiling. 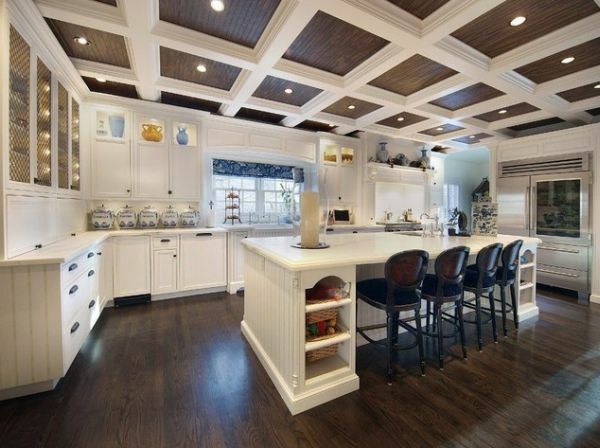 In this large kitchen, the coffers are painted to match the flooring and kitchen island bar stools. This approach helps lend the space a harmonious, cohesive look. Lit cabinets and accessories add visual interest. In the picture above, a living room with a traditional coffered ceiling. Dark-painted floor-to-ceiling windows offer adequate natural light. A fireplace adds warmth and creates a cozy atmosphere. An oversized piece of art, a zebra-patterned area rug, and a pair of mirror coffee tables add visual interest and personalize the space. As it also uses geometric shapes, in one way or another, this coffered ceiling style is a variation of the traditional coffered ceiling. However, with its triangles, hexagons, octagons, or other shapes, usually beautifully embellished with crown molding, it looks far more sumptuous and definitely helps create spaces that exude luxury, opulence, and sophistication. Note that any geometric shape will work, the only limit is the homeowner’s imagination. In the picture above, an appealing formal dining room with a slightly antique feel. 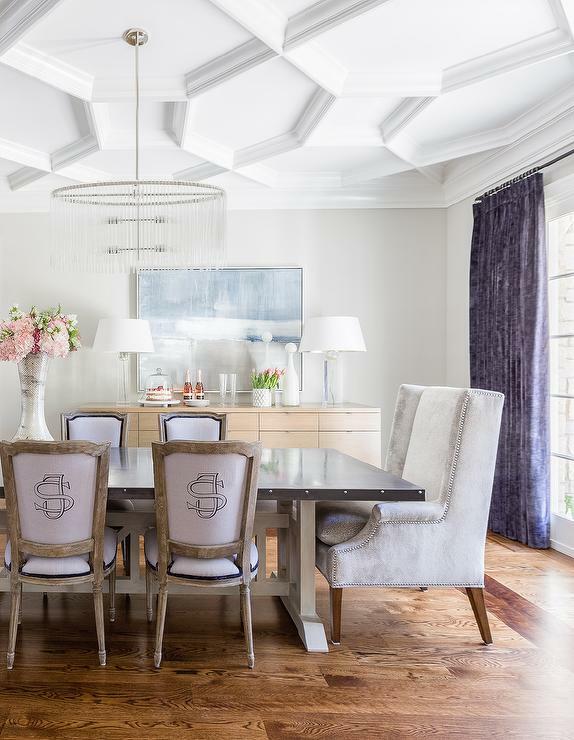 An intriguing coffered ceiling complemented by a gorgeous chandelier immediately grabs the eye. Wooden flooring and a dining set add texture and an organic vibe. Luxury fabrics create a sense of opulence and sophistication. A piece of wall art stands out against the background of the white walls and adds extra visual interest. Flowers bring color, charm, and freshness. In the above-shown neutral living room with a textural look, a mind-blowing coffered ceiling of complex design definitely makes a statement. Matching table lamps create a sense of harmony. Accessories add elegance and visual interest. Flowers bring dashes of color and freshness. Definitely a space with character! Above, an airy living room with personality. A breathtaking octagon-patterned coffered ceiling complemented by adequate artificial lighting makes an instant focal point in this contemporary space. Furniture pieces offer functionality, color, texture, and visual interest. Truly an impressive space! Usually of simple design, rustic-style coffered ceilings are commonly made of reclaimed or distressed wood, almost without embellishment of any kind. Especially when coordinated with wooden flooring, they add warmth and coziness and help lend any space a charming farmhouse-style look. Above shown, an adorable living room. An oak coffered ceiling adds elegance and texture. A floor-to-ceiling fireplace creates a cozy, warm atmosphere. Oversized transom windows offer adequate natural light. A skirted sofa complemented by matching armchairs provides comfortable seating. Embellished side tables, a gorgeous Shabby Chic-style chandelier, and stylish accessories add to the appeal of the space. However, when used in contemporary spaces, they instantly add charm, personality, and an organic vibe. In the above-shown picture, a magnificent contemporary kitchen. 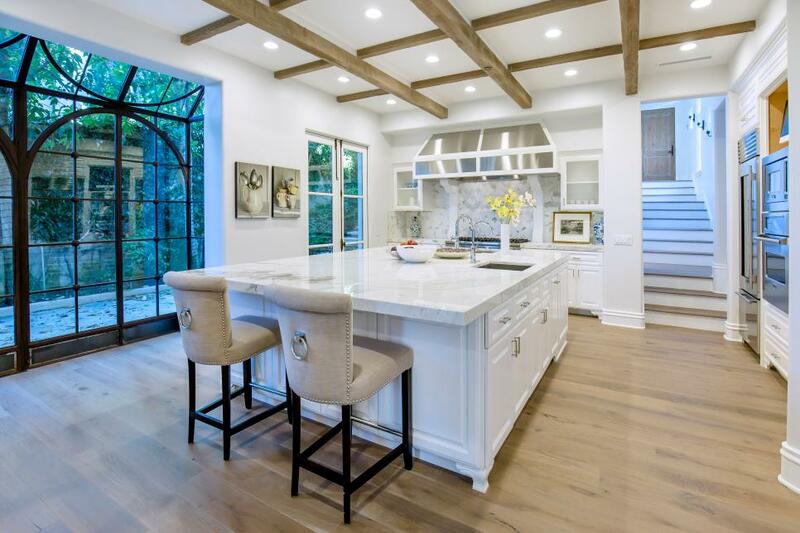 A coffered ceiling of simple design trimmed with rustic beams coordinated with lightwood flooring stands out against the crisp white walls and helps create a warm, inviting yet sophisticated space. Arched French doors offer adequate natural light. Pieces of wall art add artistic touches. Definitely a classy space! Although they are an architectural feature that is characteristic for traditional interiors, actually, coffered ceilings work well in any space and are always a striking, statement element. Whatever their style, they add elegance, depth, dimension, texture, and visual and architectural interest. Plus, coffered ceilings help create a sense of coziness and unexpectedness and can personalize any room.